“Resonance analysis” is an additional function of the program “Cross narrowband spectrum”, which allows to implement analysis of frequency characteristics of the systems that are exposed to a particular impact. The resonance is calculated between the input impact (input signal) and system response to the impact (output signal). 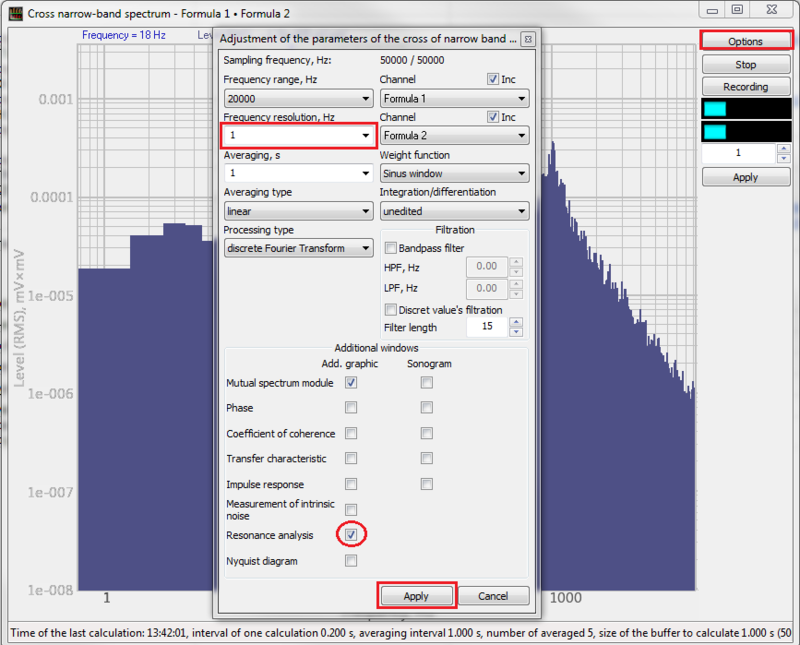 In order to enable the dialog window of the “Resonance analysis” program, activate the parameters configuration menu using the “Options” key in the “Cross narrowband spectrum” program. To enable the program window, select the option “Resonance analysis” in the section “Additional windows” (see the “Add. graphic” column). Please, note, that for the purpose of resonance search it is necessary to set a different value of frequency resolution parameter. As the necessary parameters are set, click the “Apply” key – you will see the dialog window of the program. The dialog window is separated into five sections used for displaying of the controlled parameters at a particular time moment. The upper section of the window displays transient characteristic, phase, log with the recorded resonance frequencies and corresponding parameters (natural frequency, resonance frequency, Q-factor, damping, phase, and amplitude). The bottom part of the window is used for continuous recording of the parameter (or several parameters) selected by the user and corresponding to the current resonance frequency. This part of the program interface is also used for the controlled object dynamic control. The parameters to be displayed can be selected in the corresponding list. The following parameters are available for graphical representation: natural oscillation frequency of the controlled object (Fo. ), resonance frequency (Fr), Q-factor (Q), damping (β), phase and amplitude. Using the program Resonance analysis, specialists of ZETLAB Company have reproduced one of the earliest laboratory experiments used for evaluation of frequency characteristics of SDOF systems. This experiment was first introduced by R. L. Barnosky. A cantilever beam is attached to the fixture of the vibration exciter in such a way so that one end of the beam is firmly attached to the center of the vibration exciter while the other end is free. 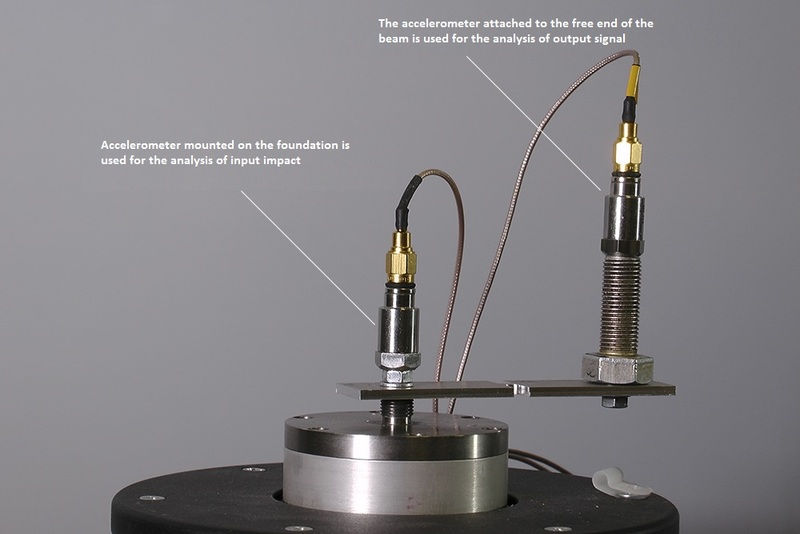 Two accelerometers are used for the control of cantilever beam frequency characteristic – one is attached to the foundation in order to register the input impact, while the other at the free end of the beam is used for recording of the output signal. The input impact (bandpass noise) is generated by the program “Noise generator” from the scope of ZETLAB Software package. 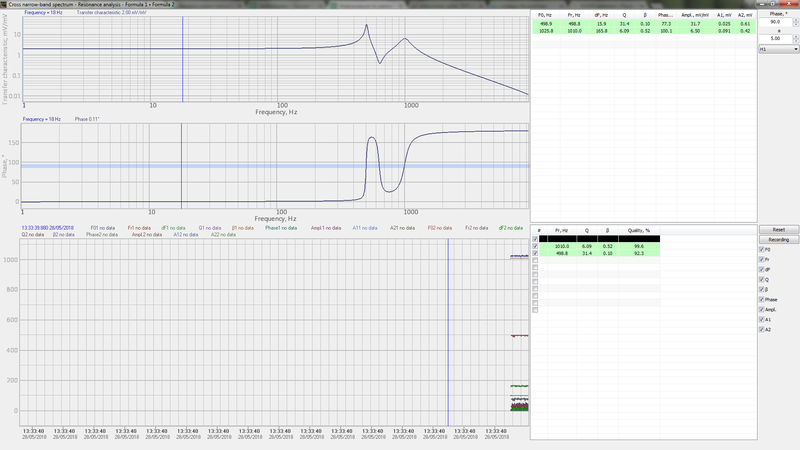 Evaluation of amplitude and phase characteristics are shown in the graphs at the top section of the program interface. As you can see, the amplitude characteristic has a clear peak at the frequency of ∼ 56 Hz, while the phase characteristic also has a curve at the same frequency (these graphs are quite typical for physical systems with a single degree of freedom). This indicates the normal first mode of the cantilever beam that will be used for further control. The experiment has shown that the “Resonance analysis” program is a simple and convenient way of frequency characteristics evaluation, which allows to obtain comprehensive data about the controlled systems.